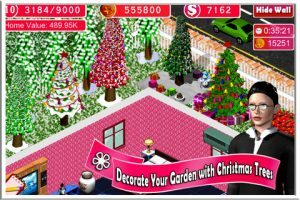 Home Design Seasons is an iPhone game developed by Arcade Studios. In this interior design game, you carefully arrange over 300 decor items like furniture, electronics, kitchen items and more. With Santa as your houseguest, your goal is to make your home welcoming and inviting. While some of the in-game text is a bit hard to understand due to poor English writing skills, the overall game does have some surprising elements. I like the fact that certain rooms in the house can only be unlocked after a certain level. It does a lot to incentivize the game, which doesn’t have much urgency because of its genre. There are also some exterior design elements to be played with, including roads, trees, and a garden. Oh, and there’s a Christmas tree, too. Some of the proportions seem a bit off: couches seem to take up a surprisingly small amount of space in a room, for example. It’s a good deal for the players, however: there’s plenty of room to place all of the hundreds of knick-knacks around the house. The graphics are solid, and there are tons of ways to customize your home. One thing I don’t like about the shopping menu system is the fact that if you accidentally tap on an item you can’t afford, you don’t get sent back to the previous screen: the screen goes away altogether. The weather outside may be frightful, but this seasonal, fun, and free game is certainly all kinds of delightful. Home Design Seasons is great fun, but if you’d prefer something without a seasonal theme, you can also check out Arcade Studios’ free app Dream Home Design. If you’re a fan of interior design games, there’s no reason not to check out this iOS title. 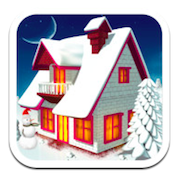 Home Design Seasonsis compatible with iPhone, iPod touch, and iPad. Requires iOS 4.3 or later.